Supply ventilation is needed in those rooms where people are located, and exhaust ventilation – in rooms with sources of odors, humidity. The balance is very important: the amount of air that has entered the house – the same amount should leave the house. If the house has exhaust ventilation, but there is no supply air, fresh air does not flow through the sealed windows and doors, exhaust ventilation will not work, it simply will not be able to draw air from nowhere. Natural exhaust ventilation of a private house. This is the simplest and low-cost ventilation for your home. It does not require complicated equipment and power consumption. All that is needed to create it is an asbestos-cement pipe with a diameter of 150-200 mm, a deflector on the pipe head that will strengthen the traction and protect the room from rain. When building a house, air ducts are laid in the walls or the brick is laid out and vertically removed above the roof of the house. One exhaust duct per room. If you connect several rooms to one channel, air with odors will flow from one room to another. Removal of air is due to the difference in air temperatures in the street and in the house, the difference in pressure or the height of the exhaust ducts, the wind. – The volume of exhaust air is not regulated. Mechanical exhaust ventilation is used where there is not enough natural. In mechanical systems, fans, check valves, speed regulators are used. One system can remove air from several rooms. – Requires electricity and periodic maintenance. Why good ventilation is a must for your home? Consider an ordinary room of 20 m2. In this volume of air can be dissolved in the form of steam up to 870 grams of water. Suppose, initially in the air of the room was 217 grams of steam, i.e. the relative humidity was 25%. If ventilation is completely absent, the windows and doors are tightly closed, this is what happens: 2 people in about 8 hours will evaporate about 500 g of water. Thus, the humidity will be almost equal to 100%. If the room has a smaller volume, the picture will be even worse. In actual conditions, the air circulation through the slots (in particular, under the door) slightly improves the position. Nevertheless, it is obvious that without ventilation the situation will always be far from ideal. In the same circumstances, for 8 hours, the concentration of CO2 will increase by 2-3%, that is, several times compared with the initial level. The amount of oxygen will decrease by the same 2%. And this is the first reason for lack of sleep and headache. Remember how people sleep in a wooden house and in a city apartment. In the winter, draft is stronger, because warm indoor air tends up the exhaust ducts. In summer there is no temperature difference, zero-point traction – and air exchange practically stops. At the top, the pressure is lower than at the surface of the earth. Therefore, the higher the exhaust channel ends, the greater the pressure drop. The wind appears when the atmospheric pressure is distributed unevenly. If there is a zone of increased pressure near the windows, and there is a zone of low pressure at the outlet of the exhaust pipe, the air will easily enter the house and easily exit outside. There is no way to control the wind, the air pressure, or the temperature outside the window. This is the main drawback of natural ventilation – the dependence on weather conditions. But there are several tricks that will help to make natural ventilation in a private house with your own hands. Some of them can be used only at the design stage, others – even in a built house with a clean repair. The exhaust ducts should be located in the central part of the house, in the interstitial space. So the ducts will always be warm. In winter, this will increase the temperature difference and increase the draft in the ventilation. It is necessary to choose the type of air ducts: rectangular or round ducts. If you need to save space, choose rectangular, they take up less space. If there is enough space between the walls, choose round air ducts. With them, air exchange is more intense, the pipes themselves are easier to assemble. If you have chosen round air ducts, you will need to make a choice between rigid and flexible (corrugated). On rigid pipes, air comes with less resistance. It is better to use them. But corrugated pipes are easier to install. The choice is yours. If possible, make the channels longer and wider – the pull will be stronger. 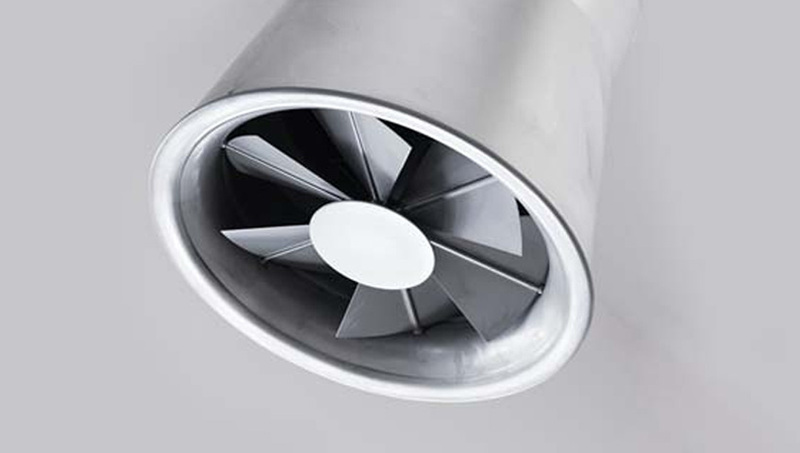 Calculate the diameter and length of air ducts on an online calculator. Try to use exhaust air ducts of the same diameter. If this is not possible, then the connection of pipes of different diameters should be smooth. The deflection angle should not be more than 30 °. Properly align all connections in the duct system. Any roughness on the inside of the channels will increase resistance and reduce traction. Make as few rotations as possible of the ventilation ducts. Each turn reduces air draft by 10%. Raise the exhaust pipes at least half a meter above the roof of the house. This will increase the height difference and thrust. At the end of each exhaust pipe, install the deflector. It will protect the pipe from rain, insects and debris. But the main thing is that the deflector cuts the wind flow, a rarefied zone with low pressure appears. This allows you to increase traction by 20%. In the ventilation holes in the bathroom, install exhaust fans, in the kitchen – the hood. With them, the natural exhaust will turn into a mechanical one. And will cease to depend on temperature, wind and other weather conditions. If the sealed plastic windows are permanently closed, then the extractor will not work. Regularly ventilate the rooms through the windows, at least in the microventilating mode. The natural influx through the slightly opened windows, like the natural exhaust, depends on the weather conditions. A fixed inflow will be provided by special in-line devices with a built-in fan: ventilators and breathers.